The $25,000 International Open Jumper class was a Time First Round format with 26 entries. Deslauriers went tenth in the order and was chasing the fast time of 53.76 seconds set by Darragh Kerins on Night Train, owned by Double H Farm. Kerins finished in second place, while Carolyn Kelly and Rulanda were third in 53.46 seconds. Deslauriers and Paradigm, a 14-year-old gelding, sped easily through the course with neat turns to bring the winning time down to 52.16 seconds with no faults. Although there were eight clear rounds in the class, no one was able to catch his time. "It feels good. I had a so-so week last week in Harrisburg, so it's good to come here and break the ice in good fashion the first day and win. My horse has been jumping well, just a little unlucky here and there. But today, he was great," said Deslauriers. Deslauriers felt that Paradigm was comfortable with the speed class as his opening trip at Washington. "This horse is very good usually in these Time First Round classes. It's good for me to let him go the first day to catch everything a little bit forward," he explained. "I've known this horse for a few years now, and I know him well enough to take those risks the first time in the indoor and to go fast." 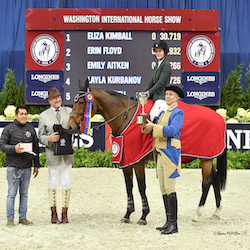 This is Deslauriers' first time back to the WIHS in more than five years and he said he was enjoying his time in Washington D.C. "It's a nice city to come to and a nice show. Everything was great for the first class," he said. Hillary Dobbs, Leading Open Jumper Rider at the 2007 WIHS, kept her winning form by taking the blue ribbon in the $20,000 Gambler's Choice. She rode Marengo, her horse that won two classes at WIHS last year. Dobbs said the Gambler's Choice is "little bit stressful," due to its uncertain nature of choosing your own course and being ready for anything. She and her trainers, Missy Clark and John Brennan, were brainstorming courses, but made last minute changes to the plan as when McLain Ward was was only behind Dobbs by 70 points. "Missy masterminded a great course," said Dobbs. McLain Ward just missed winning the Gambler's Choice class two years in a row. He and Goldika 559 finished in second with 1200 points, just behind Dobbs' 1270 accumulation. Christine McCrea and Twisther finished third with 990 points. Dobbs thought her opening class with Marengo was the perfect setting for her speedy horse. "It was his first time in the ring this week, and I was very pleased with the way he jumped. He felt fresh and careful. He enjoys this kind of competitive class too, galloping and turning. He's just a very competitive horse, and this is right up his alley," she said. The night session featured the always popular Barn Night competition, so the seats were full of enthusiastic fans. Marengo and Dobbs were unfazed by the loud atmosphere, and Dobbs actually thought it made her horse rise to the occasion. "I think the more atmosphere and cheering and the more I'm spurring him on, makes him jump even better," she said. "He feels the presence of the crowd. I enjoy those kinds of fun classes here. I'm looking forward to the costume pair class tomorrow!" Paige Johnson of The Plains, VA, and Chiron S were last to go and were first in the Amateur-Owner Jumper Time First Round class with a clear round in the fastest time of 55.964 seconds. Second and third places went to Natalie Johnson of Greenwich, CT, with Rodenburgh's California, with no faults in a time of 60.905 seconds, and with her horse, Tokade de Kalvarie, with zero faults and a finishing time of 67.961 seconds. Alexandra Arute of Avon, CT, and Saphira took home the top prize in the opening class for the Junior Jumpers. Going fourth in the class of 22, they set the standard that no one else could beat with a 55.844 second, zero fault round. Clementine Goutal and Rastella, owned by Halifax Farm in Wellington, FL, were second with a clear, 56.505 second round. Third place went to Kimberly McCormack on Jamison, owned by Athlone Partners of Elmira, NY, with a clear round in a time of 57.276 seconds.